With the onset of November month, it's that time of the year when the entire nation supports Movember. And it's also that time again when the month of Movember comes along with November like hand in glove. What started as a small concept by a group of 80 men in Adelaide, nearly two decades ago, soon caught the fancy of the entire nation and later the entire world. Movember is not just about letting your hair follicles grow wild, it' also about creativity and solidarity – all for a good cause. This event has gained popularity in countries like Australia, North America, Europe and South Africa. Each year during Movember blokes across the globe experiment with their moustaches and style it, get creative and spoil it to sport some of their most quirky looks in a year. But don't lose heart if you are not fond of growing a mo as there are several other ways to show your camaraderie towards your fellow brothers and raise funds to create awareness of prostate and testicular cancer and mental health. Attend free screening of movies across Australia during this month (from 7th Nov to 21st Nov) and witness some classic "Mo" scenes and moments. Rocket Rooftop (Adelaide), Rancho Notorious (Melbourne), Limes Hotel (Brisbane), Soda Factory (NSW) and The Aviary (Perth) are screening epics like Pulp Fiction, Chopper, The Castle and Top Gun to entertain you and create a Mo bond between brothers. Another healthy way to showcase your support for Movember is by participating in the Mo running events in Brisbane, Melbourne and Hobart. The Mo Run in Melbourne is called City2Sea and it kicks off from St. Kilda Road on 17th November at 8 am. So go and run to endorse a healthy lifestyle and generate more awareness for your fellow mates. Okay so this is for all those who think they know it all about Mo. You can host parties for your folks and friends and put their knowledge about Mo to test with interesting trivia questions. Alternatively you can also register yourself for free with the official website of Movemeber and receive a trivia kit from them to make your party more fun and interesting. It's not just men who can support this cause by growing mo. As a woman you too can hold up the torch for Movember by becoming Mo Sistas. All you need to do is become the driving force for the men in your life and cheer them on to participate in this nationwide celebration. 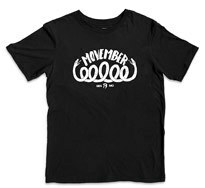 Right from artificial Mo to t-shirts, caps, wrist bands and jackets are some of the excellent ways to show your support for this event. There are plenty of stores across Australia which sell such merchandise, so grab what you like the most and join hands for some fun and a noble cause. For more information on this event check out the official website of Movember. Unleash the creativity of your Mo and let it run wild and free because you may just earn some reward, some appreciation and lots of goodwill. Spread the word and become a part of this charity as Mo Bros or Mo Sistas.